WEDNESDAYS 4 p.m. - 8 p.m.
for the Spafford Food Pantry! Thank you for your support! Transfer Station permits are available either at the Town Clerk's office or by mail with a self-addressed, stamped envelope and a check made payable to Lisa Valletta, Town Clerk. The cost is $30.00 per year. No more than two decals will be issued per property address. Permits are not sold at the Transfer Station. The Permit is valid for one year. Your renewal is determined by the month of the original purchase: if you purchase a Permit in March, it must be renewed by March 31 each year. The year on the Permit is the expiration year. The appropriate fees are to be prepaid to the Town Clerk. A receipt will be issued for presentation to the Transfer Station attendant. Disposal of an item with refrigerant/coolant requires an additional $10 fee per unit. This fee is to be prepaid to the Town Clerk. 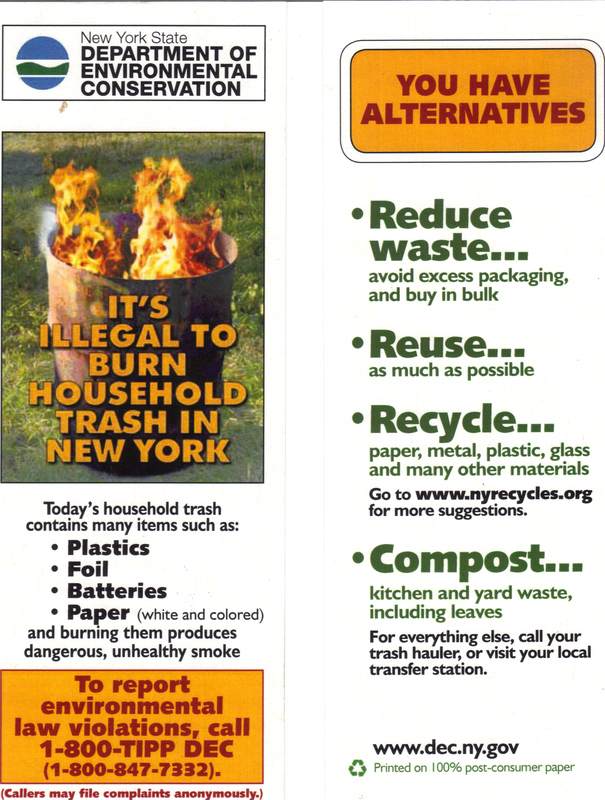 A sticker will be issued and is to be applied to the unit prior to disposal. With the sale of energy saving bulbs on the rise, it is important to know how to get rid of these bulbs when they are spent as they contain small amounts of mercury, a potent heavy metal pollutant. All of the ACE and True Value Hardware stores in Onondaga County partner with OCRRA and accept fluorescent bulbs from residents. Lowe's and Home Depot also accept CFLs. All open vehicles entering the Transfer Station must have a tarp covering their materials. Tarping prevents trash or recyclables from becoming litter on our roads. It also prevents customers from being fined up to $1,000 by the NYS DEC. Untarped vehicles may be refused access to the Transfer Station. In towns with a total population less than 20,000, (Spafford population is 1,686) you may burn tree limbs with attached leaves. The limbs must be less than 6 inches in diameter and 8 feet in length (also referred to as brush). However, this is not allowed from March 16 through May 14 due to the increased risk of wildfires.